We regret there can be no refunds, even in the event of inclement weather. The shows go on rain or shine. In the event of severe weather conditions, a coordinated campus-wide alert will be issued. 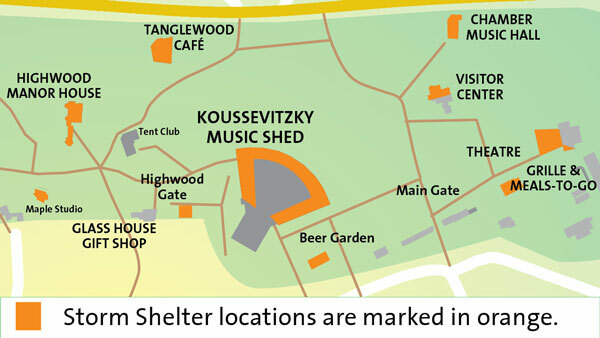 Patrons and staff will be directed to shelters in a safe and orderly manner by our staff and loudspeaker system. Please note that patrons assume responsibility for properly securing their lawn equipment and any damages to persons or property arising from the use of such equipment at Tanglewood. Camping tents are not permitted on the grounds. Tanglewood retains the right to prohibit the use of any lawn equipment that interferes with its infrastructure or impairs the lawn experience for other patrons.